Join this webinar for a discussion on SIDBI's gender mainstreaming research, which studied 26 financial service providers and one network to answer questions releated to gender integration in microfinance. Sonal Jaitly from SIDBI's Poorest State Inclusive Growth Programme (PSIG) and Seemantinee Khot, the lead researcher of the study, will share findings from the research. Join the Aspen Network of Development Entrepreneur's (ANDE) annual metrics conference for discussions and peer learning on best practices in impact measurement. SPTF's Amelia Greenberg will lead a breakout session on June 12 focused on using outcomes data to guide strategic decisions. The session will draw on lessons learned from SPTF's Outcomes Working Group. Join the next meeting of SPTF's Social Investor Working Group for a discussion on the opportunities and challenges in responsible financial inclusion and an update on current topics for the Working Group. This meeting is open to investors only. Investors can register for the meeting here and view the draft agenda here. For any questions, please contact Katie Hoffmann. See below for more details. The Responsible Finance Forum is launching the Guidelines for Investing in Resposnible Digital Financial Inclusion at a conference organized by Goodwell Investments. The Guidelines are meant to accelerate investments that create value-added benefits for digital finance clients. Last month, SPTF held a webinar to discuss the Guidelines with IFC, DEG, and CDC Group -- all of which helped with the Guidelines' development. Please join the SPTF Secretariat and Board of Directors in thanking Leticia Emme for her six years of excellent work for the SPTF. We are excited for her as she embarks on her next step in the impact investing sector with the Global Impact Investing Network. "We admired her strong work ethic and commitment to creating a responsible inclusive finance sector," said SPTF Executive Director Laura Foose. "Thank you, Leticia!!" Going forward, for questions related to the Social Investor Working Group, please contact Katie Hoffmann. For questions related to the Responsible Inclusive Finance Facility for Central America and the Caribbean, please contact Aracely Castillo. The full draft agenda is available here. SPTF would like to thank the Ministry of Foreign and European Affairs, which is sponsoring the meeting in partnership with the Inclusive Finance Network Luxembourg (InFiNe). MicroSave's Venkat Attaluri discussed the risks related to agent network management. Rafe Mazer of FSD Kenya discussed pricing and pricing transparency in DFS investments. Representatives from Branch International and Kopo Kopo joined in to discuss how their organizations disclose pricing to consumers. IFC, DEG, and CDC shared details on the development of the Guidelines for Investing in Responsible Digital Financial Inclusion. IFC shared its due diligence process for DFS investments. The Arabic Microfinance Gateway, in partnership with the SPTF Refugee Microfinance Working Group, hosted a webinar in Arabic earlier this month that focused on the recent evidence and strategies for the financial inclusion of refugees from CGAP and UNHCR. Read more about the webinar here. This followed an April webinar, which looked at the experiences of Al Majmoua in Lebanon and Microfund for Women in Jordan with serving refugee populations. The recording and presentation (both in Arabic) are available here. Smart Campaign announced that 100 financial services providers have now attained Smart Certification, which certifies that a provider meets all clients protection standards. SPTF congratulates all 100 financial service providers on this achievement. 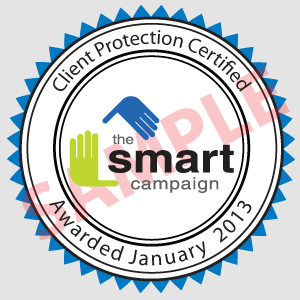 Smart Campaign is celebrating the milestone by encouraging everyone to share what client protection means to them, using the hashtag #SmartCertified100. Read the first of a blog series on 100 certifications here, where Smart Campaign Director Isabelle Barres reflects on the growth of Campaign's work. This year's European Microfinance Award, hosted annually by the European Microfinance Platform (e-MFP), will focus on financial inclusion through technology. It will seek to highlight how technology-enabled services can improve financial access for low-income and financially excluded clients. Applications are due May 23, 2018 at 23:59 CET. Visit the European Microfinance Award website for details on how to apply. The Microfinance Centre (MFC) has published two new reports, focused on the state of microfinance and SPM implementation. For any questions, please contact Nadia Szypilow. The Responsible Microfinance Facility (RMF) is an initiative aimed at strengthening capacity and SPM practices of financial institutions in Africa and the Middle East. The RMF offers trainings and provides co-financing to financial institutions for capacity-building activities. Launched in 2015, the RMF is funded by the Agence Française de Développement and managed by SPTF in collaboration with the Smart Campaign. The facility has been extended to run through 2021. The RMF has received 217 applications to date for trainings or grants to co-finance projects that were designed by FSPs. The RMF has approved 48 trainings and 66 co-financing grants, implemented across 30 countries in Africa and the Middle East. The RMF Steering Committee reviews applications on a quarterly basis. Please apply by June 19, 2018 to be considered in the second quarter 2018 review. Application forms are available in French or English. RMF is co-financing two new activities on digital transformation. FSPs may apply for a specialized training or an upgrade project on transformation. Applications will be on RMF's website soon. Please email rmf@sptf.info for further information. Not in Africa or the Middle East? SPTF manages two other regional facilities similar to the RMF model: the Responsible Finance Facility in Central America and the Caribbean (FFRI-CAC) and the Responsible Inclusive Finance Facility in Southeast Asia (RIFF-SEA). Earlier this year, SPTF started collecting annual membership fees from its stakeholders. We wish to recognize our sustaining members, whose partnership and financial support ensure our ongoing operations. Their support sustains the only inclusive finance community that spans all industry stakeholders -- and therefore the only means of building the cross-sectional knowledge, strengthening practitioners, and and sustaining the focus needed for industry-wide change. To further acknowledge these members, we will be highlighting a few such organizations each month. Send job openings to info@sptf.info. Must have "SPTF Newsletter Job Announcement" in the subject line or will not be included. This section is for organizations to announce job openings. Please do not send resumes. We welcome your suggestions for future content. Please email us at info@sptf.info using the subject line "SPTF Newsletter Content Suggestion." To make sure you are receiving SPTF emails, please add the domain "sptf.info" to your safe sender email list. Explore the resources below for tools and guidance to help strengthen your social performance management and achieve your social and financial goals. You are receiving this mail because you opted to receive messages from the Social Performance Task Force Newsletter.